I'm in Chicago with my hubby and both of my boys. It's rare the four of us are together for 3 whole days. Lots of spirited conversation, time together and all four of us just got back from the gym after working out together. My heart is filled with joy. Back home tonight and we'll all go our separate ways. I will hold this feeling until the next opportunity to be together. Got a lot of requests to explain how I made this block. So, in the spirit of doing things for others today, here is the 'Be still my heart' block tutorial, just in time for some Valentine's Day crafting. 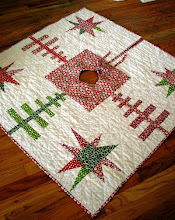 I used this block to make the quilt in the picture above as well as a pink version without the sashing. Step 1: Pull a set of fabrics. Small scale prints work great for this block. Don't be afraid to throw in a solid or two. For each block you will need ten 1" x 22" strips. Fat quarters work perfectly for these strips. Step 2: With right sides together sew strips together using a 1/4" seam allowance. I like to sew my strips in sets of two or three and then join the smaller sets together. I press after each seam. Make sure that you press your seams in the same direction. You may want to alternate sewing strips from the top and then from the bottom. This will prevent your strip set from getting wavy. Step 3: Continue joining sets until you have a strip set of 10 one inch strips. The width of my strip set measured 4.75". (this measurement may vary depending on whether you are sewing a scant 1/4" seam or not.) This measurement is important because it will determine the size of the background squares. Measure the width of your strip set and remember that number. Step 4: Use your rotary cutter and ruler and straighten one edge of the strip set. Step 5: Now cut four 4.75" squares (or use the width measurement of your strip set) from your strip set. Step 6: Cut two squares from background fabric the same measurement as your strip set squares. Mine are 4.75" squares. 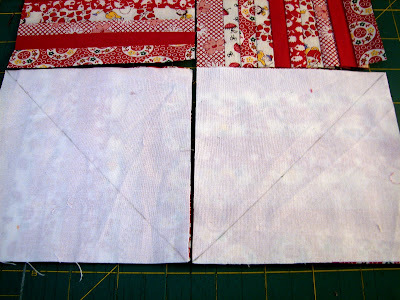 You will also need to cut four two inch squares from the background fabric. Step 7: Use a quilter's pencil or other marking tool and draw diagonal lines on all of the background squares that you cut in step 6. Step 8: Arrange your strip set squares like the picture below so that the strips alternate between a vertical and horizontal orientation. Step 9: Lay the two large squares on the bottom strip set squares so that the diagonal lines you drew form the bottom point of the heart. Pin so that you will be able to sew ON the marked lines. Step 10: Sew ON the drawn lines. Do this for each of the squares. Step 11: Press so that the squares look like this. Notice at this point that you have two layers of the background fabric. 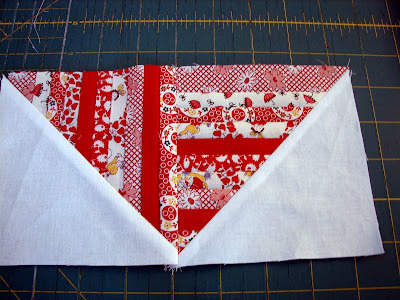 Step 12: Take each square and flip back one layer of the white fabric. Line up your quarter inch mark on your ruler on your stitching and trim. The triangles on the right will go into your scrap box. 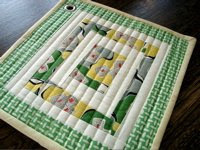 Flip down the single layer of background fabric and you will have your completed square. Two of these form the bottom of the heart. They should look like this. Step 13: The same process is used to complete the top of the heart. Place the four 2" squares like this. Make sure the drawn lines are in the correct position to form the heart shape. Step 14: Sew ON the drawn lines just like you did for the bottom squares. Flip and press and trim, again just as you did for the bottom squares. They should look like this...well, not quite like this. I didn't pin my squares and look what happened. Instead of the strips being rotated horizontal/ vertical...mine ended up like this. I did it again, and guess what? I made the same mistake TWICE. Third time is the charm! They should look like this. Step 15: Now it's time to put the block together. Put the bottom squares right sides together , pin, lining up the center edges and sew with a quarter inch seam. Press that seam to the left. Now you have the bottom section of the heart. Repeat this process with the two top pieces and press that seam to the right. You'll want seams opposite to nest the seams when you sew the final two sections together. See how the center seams lay in opposite directions. 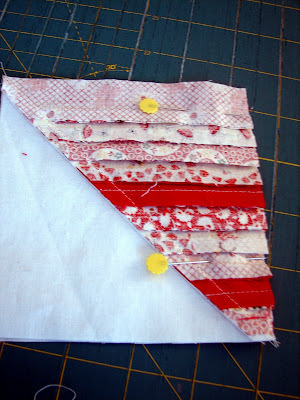 Step 16: Pin the top and bottom sections together and sew with a 1/4" seam. Then your heart is complete. I added 2" border strips to all sides of the heart to frame it. Now I have to figure out what I'm going to do with this heart. I think a bunch of these would make a spectacular quilt. One or two might be perfect for a table topper or wall hanging for Valentine's Day. If you make one or more, I'd love to see them. This is wonderful! Thank you so much. I just might get a Valentines table runner made. thank you thank you thank you. I printed your first one for inspiration for a table topper. I worked on it for a while last night (my blocks measure 8.5 in). I have the bottom 1/2 of the heart complete, but couldn't for the life of me figure out what to do with the top. Probably sleepy fuzzy brain. Now, I can't wait to go in the sewing room to finish it! Thank you for TUTE!! Awesome! Thank you for the tutorial. I love how you said at the end, "Now your heart is complete." great tutorial! I love this heart block. Love love love it! Thanks Jacquie. It is so pretty. Wonderful tutorial. Very pretty! Great directions. 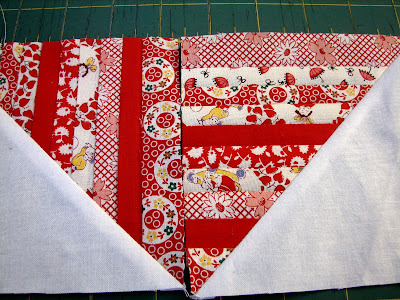 Now I just need the red fabrics for a valentine's table runner! I love the tutorial. The heart is such fun. I became a bit teary eyed when I read about your weekend with your family. In august I sent my youngest off to college. I am missing the time with the kids traveling with us. It seems like time passed too quickly. Enjoy your time! Love the heart block...thanks for the tutorial! And happy for you that you get to be together as a family! I live 45 minutes west of Chicago, at least you were here when we were not setting wind chill records, nothing is better than spening time with your family!! A million that yous for the lesson on your heart, i am soooo going to do that, oh for next year BUT I am going to do it!!! so glad that you are having a great time there - together :) Love your heart - I made a quilt of hearts for Ella a little over a year ago . . . I love hearts! So pretty! I have made hearts like that but using a "solid" piece of fabric instead of the strips. Love the strips much better. Thanks for sharing. Thanks for sharing this wonderful tutorial. I have been wanting/needing to make a Valentine quilt. This will be fun. I love this block. I will have to make one for valentines. It is so nice. Red is my favorite colour. Thanks so much. Well done! I always admire those of you have often share tutorials. They're a ton of work. I hope the weather warmed up a bit in Chicago for your weekend w/ the family! Thanks for the tutorial! I have some scraps ready to go! I think a bunch of these hearts in black and white with a red border would be FANTASTIC...but maybe a bit morbid? Maybe for Poe's birthday?? Thanks for sharing, I'm so glad other people repeat the same mistakes like I do! Thanks so much for sharing - a lot of work, but worth it - you will make a lot of people happy - mine is filed away in Tutorials in Favorites! What a great tutorial! Imagine a quilt with lots of different coloured hearts! 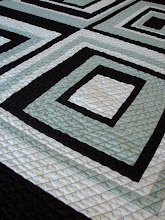 Or perfect for a scrap quilt! Thanks so much! 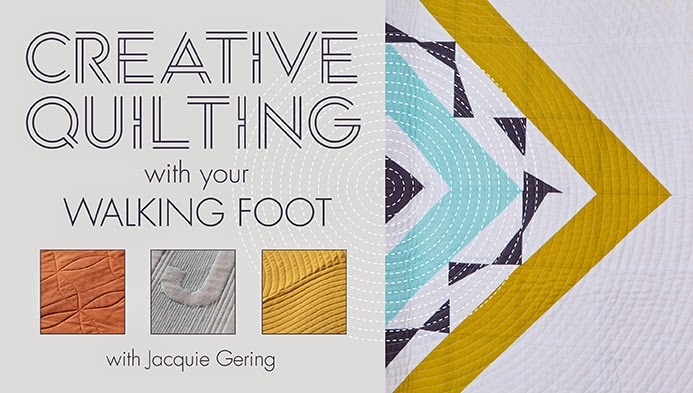 thanks so much for the tutorial, jacquie! Cute! It seems we both have hearts on the brain at the moment. Btw, I've already changed my girl's setting for commenting. Thanks for visiting her blog. It's mean a lot to her. What a great tutorial! Even though it seems so simple after your tutorial, I can't believe you came up with that off the top of your head! Beautiful!! 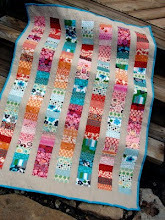 I might have to try this with some scraps, and see if I can come up with a scrappy heart block! thank you so much for the tutorial. I can't wait to make it for Valentine's day for my daughter. OK, another Flickr question. Yesterday I posted those pictures of my blocks, and today I don't see them there. Do you know why? I'm so glad you were able to enjoy your family trip together. I'm sure there was much laughter and fun and memories made. What an excellent and detailed tutorial with such perfect pictures. Well done! h yes! I do love that heart! I love that heart block! LOVE IT! 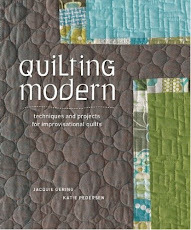 i've just gotten into strip quilting and i think this is just great. thanks! Thanks for sharing this wonderful tutorial. This will be perfect for Valentine! THanks for the tutorial--looks easy enough! Glad you got to spend some time with everyone all together. I love those moments, too, and they're too far apart. This is a great block, thanks for the tutorial! Thanks for sharing your tutorial... I will definitely add this to the "make it soon" list. That is lovely, I'm so inspired both by the pattern and the colours. This is on my to do list. Glad you had a wonderful weekend with your family ...nothing can beat that. Thanks for sharing your heart block. Such a beautiful block and so kind of you to share! 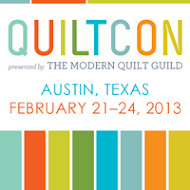 Quilters are so wonderfully generous in sharing their love of the craft. lovely to hear of your happy time with the family. thank you thank you thank you - I'm going to make one tomorrow!!!! Thank you for showing how you made this block! I've book marked it. Have you tried sewing 1/4" seam down each side of the drawn line for your HSTs? a lot less waste, but less for your scrap box LoL! Thanks for sharing! What was the finish size on this block with and without the borders? It looks perfect for a pillow I want to make for my friend! 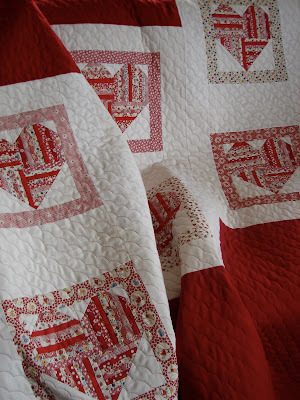 I've been thinking about making a quilt with heart blocks and stumbled across this one. It's lovely, thank you for sharing it! Jacquie - I want to thank you for such a great tutorial. I love hearts so just had to give this a go. I've added to your flickr group as asked! I have lots more ideas for this method too - just got to find the time! Thanks again for sharing. Thank you for the easy-to-follow tutorial. This heart will be incorporated into my next quilt. How large is the finished heart? What a great tutorial! Thanks so much for sharing! Thank you so mauch for sharing this technique. I am a project Linus coordinator, and have lots of donated scrap fabric, which would look fabulous in this technique! Thank you so much for being so generous your tutorials, especially "My Heart is filled with Joy", I have been wanting to know how to do this for ages. a beautiful project & instructions! TE FELICITO POR LOS TUTORIALES ME AYUDAN MUCHISIMO.YO TAMBIEN SOY FELIZ CUANDO ESTOY JUNTO A MIS 5 HIJOS.lA FAMILIA ES LO MAS LINDO DEL MUNDOY EL AMOR QUE RECIBIMOS DE ELLOS TAMBIEN. I just finished a wall hanging, based on this tutorial. I really love it. I'm thinking of a baby quilt using a rainbow of hearts. Hi, thank you so much for sharing this beautiful quilt with us. I would like to make it for my beautiful daughter in law, the heart will show her how much she means to me. I will be making it in pink. I need help with how much fabric I will need to make her a queen size quilt. 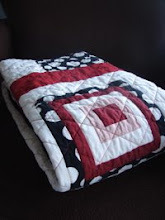 Really enjoyed your tutorial - I will probbably make it smaller as I like mini/small quilts best. Your tutorial is very clear and well done. Thank you. Thank-you for sharing. I can't wait to start it. Thank-you so much. Hi - I love this project! I now live in E. Iowa and with the fog we are having, it seems like a good day to stay home and quilt. I was intrigued by the name of your studio and then checked the "About me" on your page. Sure enough, it seems you are a Kansas native just like me! I am from the NW corner of Kansas but lived in Manhattan, KS for several years when I taught at KSU. Silvia desde Buenos Aires, Argentina. to make smaller hearts for Linus. Thank you for a lovely block and a great tutorial. Thank you for posting these wonderful, easy to follow directions. 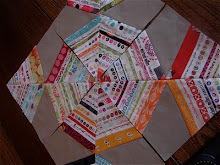 This is a perfect pattern for me to use to make a quilt for someone who gave me 'their scraps'! Thanks for sharing this great block>eager to do it when I finish my current project! I made two blocks, and turned them into door hangers. Would love to let you see them - how/where do I post the photos?